CONNECTING THE RED SEA with the Gulf of Aden and the ARABIAN SEA, bounded by DJIBOUTI, ERITREA, and YEMEN, the Bab el Mandeb is a STRAIT and CHOKE POINT. It separates the Arabian Peninsula from East Africa (HORN OF AFRICA). As its Arabic name implies (“Gate of Tears”), it is a place of worry for any ship’s captain navigating the narrow passage. It has historically been coveted by anyone wishing to control the flow of trade between the MEDITERRANEAN SEA and the INDIAN OCEAN. Egyptian barges, Arab dhows, and Portuguese caravels have all plied this narrowing passage. Each controlling nation has fought others that attempted to wrest it from them. Britain vied for dominance of the area with both the OTTOMAN EMPIRE and FRANCE. The British seized Aden in 1839 and the Ottomans returned to the northern portions of Yemen in 1849. France focused on the African coast and established the colony of French Somaliland in 1888. With the construction of the Suez Canal in 1869, the increase of shipping made the Bab el Mandeb all the more important. The French remained in Djibouti, while the British departed Yemen and the port of Aden in 1967. Yemen remains an unstable area. In the decade of the 1990s, a full-scale civil war exploded, and internal factions and international terrorist groups launched attacks against government and commercial targets. The attack on a Frenchflagged oil tanker by a small boat filled with explosives in October 2002 in the Bab el Mandeb points to continuing concerns. The Bab el Mandeb is one of the world’s busiest shipping lanes, handling the vast majority of all oceangoing trade between Europe and Asia. An estimated 3.2 million barrels of oil passed through this strait every day in 2000. 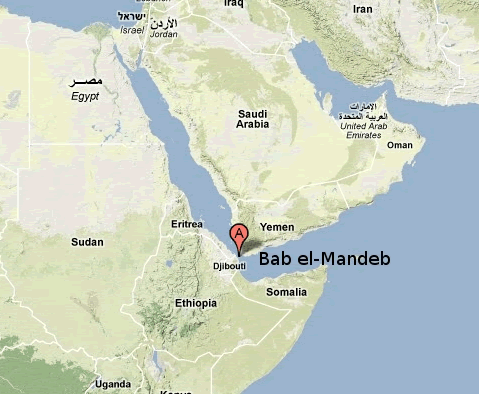 The Bab el Mandeb is about 17 mi (27 km) wide at its narrowest point between the Arabian and African coasts. The island of Perim sits astride the strait, creating two channels. The eastern channel is known as the Bab Iskender (Gate or Strait of Alexander), which speaks to the ancient lineage of navigation in these waters. This channel is some 2 mi (3 km) wide and about 98 ft (30 m) deep. The western channel has a width of about 16 mi (25 km) and a depth of 1,017 ft (310 m). There are a group of small islands lying just off the African coast.